Observing the lives of renowned leaders, brilliant scientists and notorious criminals, viewers get an intriguing and provocative inside peek into their unknown pasts, from Ben Franklin's nefarious history to Albert Einstein's hidden family drama. Other notable subjects featured on the DVD include Abraham Lincoln, J. Edgar Hoover, The OK Corral, The Roosevelts, The Mormons, George Patton, Caligula, The Rat Pack and Adolph Hitler. DID YOU KNOW THAT PRESIDENT JOHN F. KENNEDY WAS A BODYBUILDER, ROMAN RULER CALIGULA LOVED TO GAMBLE AND DRUG KINGPIN PABLO ESCOBAR BURNED MILLIONS IN CASH TO KEEP WARM? From great figures come our most noteworthy inventions, from the telephone to the theory of general relativity. But no great leader is perfect. 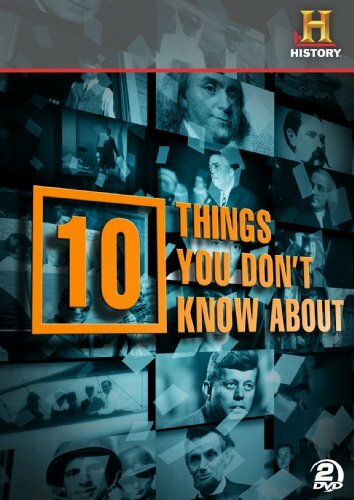 H2 digs into the scandals and family secrets you won't find in textbooks in the new series 10 10 Things You Don't Know About , the most popular of the new programs produced specifically for HISTORY's new hyped network. A+E Networks Home Entertainment, part of the Consumer Products Division of A+E Networks, is a video distributor of non-theatrical programming, featuring collectible DVD and Blu-ray editions of the high quality programming from A&E Network, HISTORY, and Lifetime, as well as acquired classic programming and sports. A+E Networks Home Entertainment brings the best of critically acclaimed entertainment presented in award-winning packaging to the special interest category.